Girvan is an Ayrshire town of less than seven thousand people and lying just to the north of the town lies the William Grant and Sons grain distillery which is the main grain producer for Grant’s whisky which you’ll find in pretty much every shop that sells spirits in the world. The Girvan Patent Still have sent me and a few other Twitter folk four expressions of their Single Grain and this review is of the New Make Spirit. Now, I’ve only had limited experience with New Make which is the liquid which first comes off the stills before being put into barrels, this particular new make has been reduced in alcohol from ninety something percent to a much more palatable 42% and stored for a short while in oak barrels. The only New Make I’ve actually had is from distillery tours and it both tastes and smells like the stuff I clean my hands with in the hospital I work in, it’s not great but it’s not supposed to be, so here we go with the Girvan Patent Still New Make. Nose. A surprisingly rich experience here, kola cubes, Strawberry which have turned, a little burn on the nose too, fresh yogurt, everybody else got bananas, perhaps I was getting my overripe fruit confused? Palette. Alcohol, don’t know if you’ve ever tried Puncheon Rum but I got that kind of taste from the off, very warming, I know this might upset people but it’s like a nice smooth good quality flavoured vodka, I don’t drink vodka but I’ve had enough to know what it tastes like. Light Oak notes, bitter orange. Finish. Moves towards gin rather than vodka now, something herbal, Lavender perhaps, something soapy. more oak, longer finish than expected. 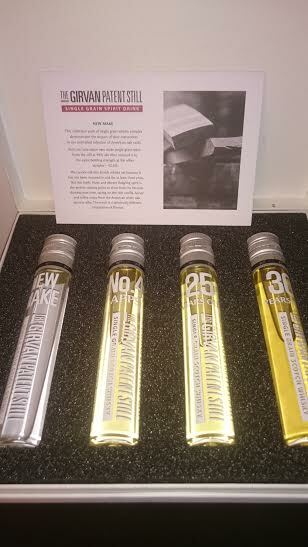 So there we have it, a surprise and something nice to talk about and it gives you an idea of how whisky starts its journey and thanks again to Whisky Wire and Girvan for the lovely sample box. Next Girvan No 4 Single Grain Whisky 42% Twitter Tasting.